Last week’s Halloween edition of Raw had a lot going on. The live show was held in Atlanta, Georgia, the site of WrestleMania earlier this year and fans were treated to a main event rematch between John Cena and The Miz. The show also featured special guests The Muppets who got involved backstage and in the ring! We’re somewhat divided with regard to our feelings on last week’s guest stars appearing on the show, but we agree that we’d both like to see a quality show that gets by on its own merits without The Muppets or the next week’s special attraction, Dwayne “The Rock” Johnson. PTB: I genuinely enjoyed The Muppets appearance on the show, but I would have liked to see something with them open the show. With the amount of promotion that went into their appearance, it didn’t make a lot of sense to have a video of The Rock start things off. Brian: Having the Muppets on Raw doesn’t really do much for me. I was a fan growing up, but having them here doesn’t work in my opinion. In recent years, WWE has gone away from the colorful characters and supernatural events (minus Undertaker) and taken a more reality based approach to the product. Am I fan of that approach, no. If I want realism, I’ll turn on the UFC. When I watch wrestling, I want to suspend disbelief and enjoy myself. I like the outlandish characters and storylines that aren’t always believable (Kane as a burn victim that wears a mask because he was in a house fire caused by UT, Papa Shango uses his voodoo powers to make goo come out of Ultimate Warriors head, Gangrel being a vampire, Demolition, etc). That’s what makes things fun. I get that there are a few exceptions (silly maneuvers like the Five Knuckle Shuffle and the Cobra), but for the most part everything is somewhat believable. With all that being said, I just don’t get how they can be so focused on making things believable and have the wrestlers interact with the Muppets. I can see how some of the spots were fun, but I just wasn’t thrilled with it. I wish more attention would be paid to booking the show. PTB: I get where you’re coming from, but this wasn’t a typical week. WWE has struggled with its identity in recent years, and I prefer a version of Raw where the Muppets can make an appearance. The main upside to having them on the show for me was creating opportunities to put wrestlers over that I normally can’t stand. 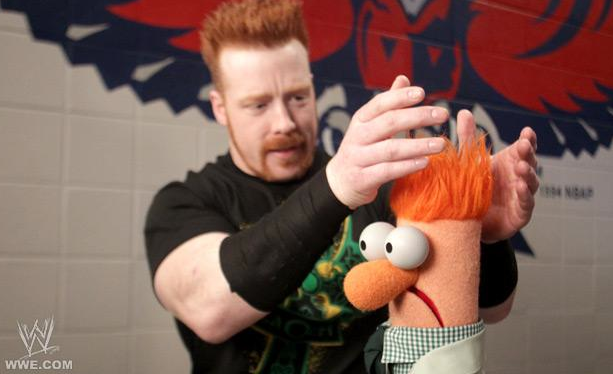 Beaker stole the show with his bit with Sheamus of all people. Jack Swagger (and by extension Vickie Guerrero) even had one of his better moments with Kermit and Miss Piggy. 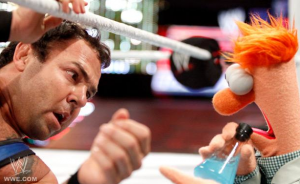 I also wish I could have seen Beaker’s assist to Santino in person just to see where the puppeteer set up. Same goes for Animal as the guest time keeper. In non-Muppet news, are Cody Rhodes, Wade Barrett, and Christian officially a faction at this point? Brian: I don’t think so. They’ve definitely been associated with each other, but aren’t officially a faction. PTB: Having C.M. Punk in the opening match was a good choice. I love the way his feud with Alberto Del Rio is developing. I know we both think he should have been more involved with the conspiracy and the walk out, but this may be better for him. Brian: It was nice to see a non-Orton match to start the show. I don’t necessarily agree that the angle with Del Rio is better than what could have happened if the booking of the conspiracy angle wasn’t rushed and taken in 20 different directions. I enjoy anything that CM Punk does, so I’ll take it. PTB: Del Rio and Ricardo Rodriguez turned in some great heel work getting Punk disqualified in his match, but Punk’s move to get Del Rio to “agree” to a title match at Survivor Series is the kind of thing that will be in highlight reels for a long time. Big Show getting some quality air time against Alberto Del Rio also took me a bit by surprise, but I’m happy to see it. Brian: I was really surprised to see him go over Del Rio. Not sure why you would have him pin the WWE champ cleanly leading into a major PPV. PTB: Divas Halloween costume Battle Royal. Best costume? I’m picking Dog the Bounty Hunter. Brian: The Bella Twins as the Mario Bros, but I’m biased. PTB: I really liked the booking for Ryder and Ziggler. The foot under the ropes do over after Ryder’s first 3-count had me thinking there was no way he’d still get the win. The clean pin on Ziggler after that was a perfect momentum builder for him. Brian: They put together a really good match. This is why they should spend some time on these mid-card guys. You don’t always have to focus an hour and forty-five minutes on Cena, Punk, HHH, Orton and Del Rio. PTB: I also really liked that the first mention of Kevin Nash and Triple H came in the last 20 minutes of the show. After al the time spent on it last week, I like that it wasn’t mentioned in every segment, and that Nash didn’t appear on the show even though we learned he was re-signed by Laurinaitis. Brian: That’s a first! Not mentioning a key segment every 10 minutes during the next show. PTB: I appreciate that change, but I’d much rather have seen more on that story than Michael Cole’s diatribe regarding Jim Ross. Brian: Cole needs to go. I’m so glad I didn’t have to hear him say, “Patented water bottle to the skull.” again this week. Would have made it 3 in a row. PTB: A three-hour Raw like the one we’re getting next week is always nice, but I’m not so excited about the Rock. Opening last week’s show with a video package of him addressing Cena didn’t help at all. I think the suggestion that he’s “back” falls flat for me when he doesn’t appear on the show. WM tickets even went on sale this week and he wasn’t there live. Brian: I totally agree. I really don’t enjoy the Rock being back and agree with a lot of the statements that Cena made that caused this whole feud. PTB: Cena actually made a point of it to the camera as he entered the area for his WrestleMania rematch with the Miz in Atlanta. Love him or hate him, Cena is “the guy [there] doing it every night.” The absence of the Rock last week allowed both he and Miz showcase what they can do. Brian: Great match! Way better than that fiasco at WM last year. More reason not to insert old-timers for a one-shot at WrestleMania. PTB: Next time, Swedish Chef or we riot! Bork bork Bork! Read more about World Wrestling Entertainment on MyLatestDistraction.